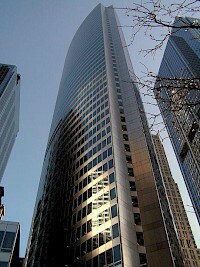 Hyatt Center is an office tower in Chicago completed in 2005. 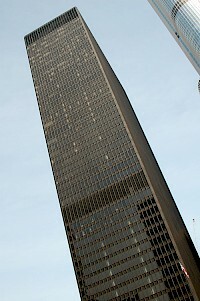 The 48 story skyscraper stands at 679 feet (207 m) on 71 South Wacker Drive. Pei Cobb Freed & Partners' striking elliptical steel and glass design is reminiscent of Tour EDF, a skyscraper in Paris, France designed by the same firm. The 1,765,000 square foot (164,000 m²) building contains 65,000 cubic yards (50,000 m³) of concrete and 12,000 tons of structural steel. 330 North Wabash (formerly IBM Plaza also known as IBM Building) is a skyscraper in downtown Chicago, Illinois, at 330 N. Wabash Avenue, designed by famed architect Ludwig Mies van der Rohe (who died in 1969 before construction began). A small bust of the architect by sculptor Marino Marini is displayed in the lobby. 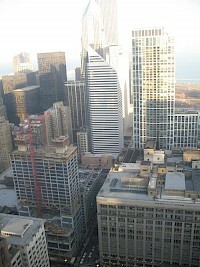 The 52-story building is situated on a plaza overlooking the Chicago River. The Inland Steel Building, located at 30 W. Monroe Street in Chicago, is one of the defining commercial high-rises of the post-World War II era of modern architecture. 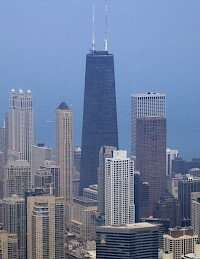 It was built in the years 1956–1957 and was the first skyscraper to be built in the Chicago Loop following the Great Depression of the 1930s. Its principal designers were Bruce Graham and Walter Netsch of the Skidmore, Owings & Merrill architecture firm. InterContinental Chicago is a hotel in Chicago, Illinois. The hotel currently occupies two Multi-story buildings. The historic tower, or "South Tower," is a 471 foot, 42 story building which was completed in 1929 originally as the home of the Medinah Athletic Club. The main tower, or "North Tower" is a 295 foot, 25 story addition, completed in 1961. The current owners of the hotel, Strategic Hotels & Resorts, has also proposed an 850 foot, 71 story skyscraper to replace the North Tower. The James R. Thompson Center (JRTC) is located at 100 W. Randolph Street in the Loop, Chicago, Illinois and houses offices of the State of Illinois. The building opened in May 1985 as the State of Illinois Center. 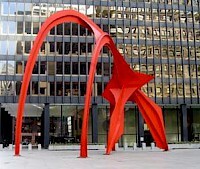 It was re-designed in 1993 to honor former Illinois Governor James R. Thompson. 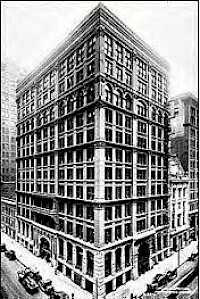 The property takes up the entire block bound by Randolph, Lake, Clark and LaSalle Streets, one of the 35 full-size city blocks within Chicago's Loop. John Hancock Center at 875 North Michigan Avenue in the Streeterville area of Chicago, Illinois, is a 100-story, 1,127-foot (344 m) tall skyscraper, constructed under the supervision of Skidmore, Owings and Merrill, with chief designer Bruce Graham and structural engineer Fazlur Khan. When the building topped out on May 6, 1968, it was the tallest building in the world outside New York City. 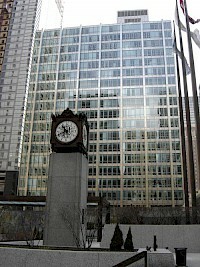 The Kluczynski Federal Building is a skyscraper in downtown Chicago located at 230 South Dearborn Street. Federal offices in the building include an Air Force recruitment office, the U.S. Department of State Passport office, an Internal Revenue Service office, and offices for both of Illinois' U.S. Senators, Durbin & Burris.